"Halal & Healthy Products Fair"
Iit is the largest exhibition area in Eurasia and we are invited to participate the fair. Most exhibitors & visitors are from China, Indonesia, Irak, Iran, Egypt, Syria, Sudan, Algeria, Malaysia, Saudi Arabia, UAE, Kirgizstan, Turkmenistan, Albania, Kosovo, Brunei, Germany, France & Russia. 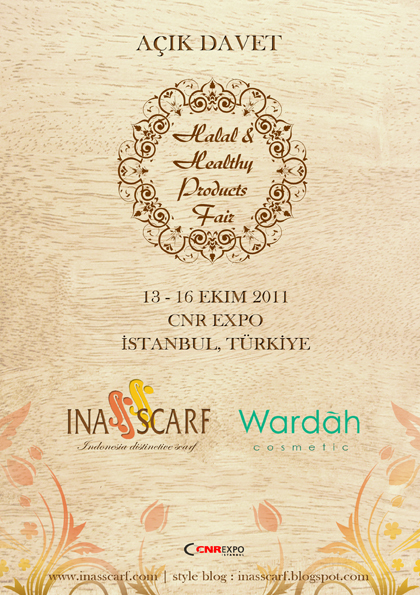 Our trip to Turkey are supported by Wardah Cosmetic , there will be a live how to scarf demo from us and some giveaways for the lucky costumers who came to visit our booth, from us and Wardah.